A special ruling has recently been announced and it’s affecting how local breweries throughout the entire state conduct business. Breweries are popping up across the South Jersey area and not only have they become a source to taste a locally brewed beer, but they’ve also become a go-to spot for people to hold events. But weekly open-mic nights and other events and fundraisers are now in jeopardy after a special ruling was put into place on Monday, September 24th. 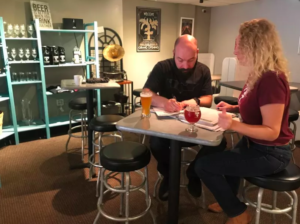 This leaves businesses like Human Village Brewing Company and Death of the Fox Brewing Company left reconsidering events they already have planned. But the ruling doesn’t stop there. It also states they can’t display menus for area restaurants. According to both owners, local municipalities are passing resolutions and writing letters to the state expressing their opposition and residents are also stepping up. They’re hoping people will sign it to help show support. “This is our opportunity to tell them that there is a demand and that there will be a chilling effect on the public and on our communities,” Megan said. “I think the state and some decision makers really need to understand … that breweries are filling an area and a need that you just can’t get at a sports bar,” said Garrity.